NOTE: To make toasted cinnamon pecans, preheat oven to 300 degrees Fahrenheit (150 degrees Celsius). Place 1/2 cup whole pecans in a resealable plastic bag and drizzle with 2 tablespoons melted butter; seal bag and toss to coat. In a small bowl, combine 1 teaspoon ground cinnamon and 2 teaspoons caster sugar. Sprinkle over buttered pecans, re-seal bag, and toss well to coat. Transfer pecans to a rimmed baking sheet, spread evenly in a single layer, and bake for 5 to 10 minutes in the preheated oven. Toss occasionally for even toasting. 2. Slice bread into 1-inch cubes and arrange in an 8-inch baking pan or ceramic baking dish. Drizzle melted butter over bread cubes and sprinkle with cinnamon pecans (or raisins, if preferred). 3. In a medium-sized mixing bowl, combine eggs, milk, sugar, cinnamon, nutmeg and vanilla extract. Pour mixture evenly over bread cubes. Gently push bread into egg mixture with a fork until all cubes are soaked. 4. Bake in a preheated oven for 45-50 minutes, or until the top springs back when lightly tapped. Cool on a wire rack for 5 to 10 minutes. 5. While pudding cools, make vanilla sauce. Combine all sauce ingredients except vanilla extract in a small saucepan and stir over medium heat. Cook, stirring occasionally, until sauce thickens and comes to a full boil (5 to 8 minutes). Remove from heat and stir in vanilla. 6. 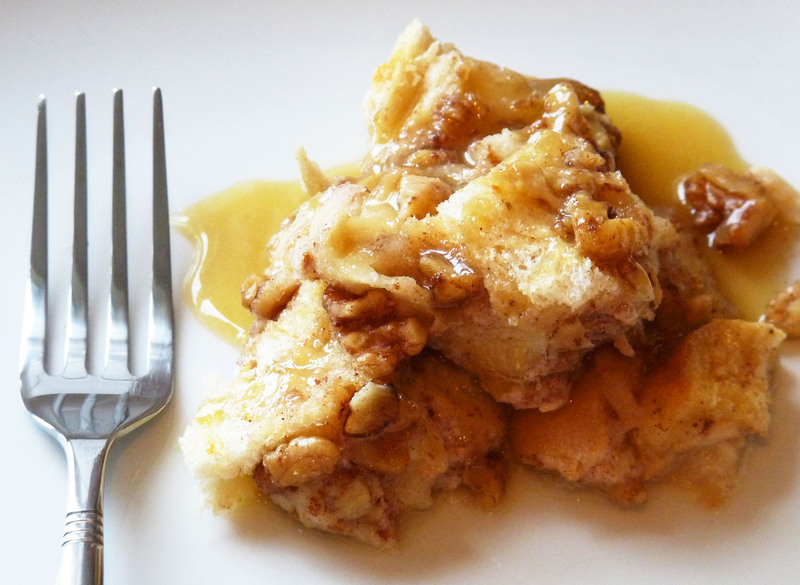 Serve bread pudding warm or cold, drizzled with vanilla sauce.